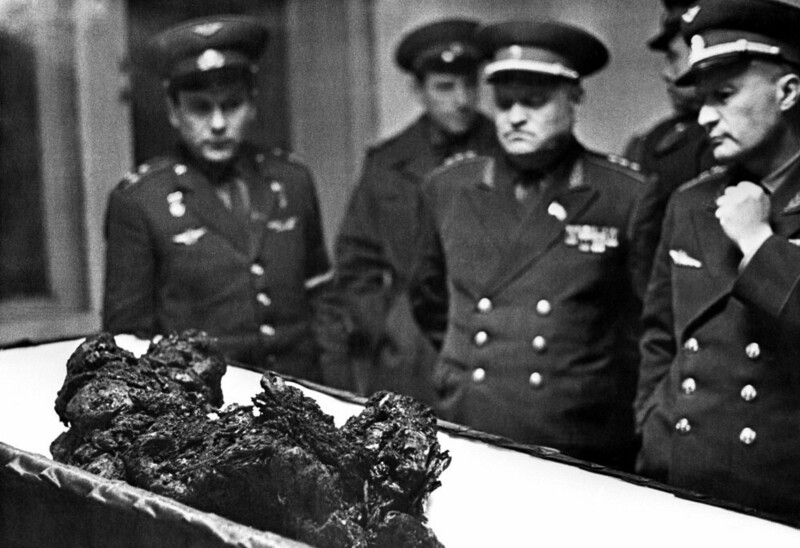 Cosmonaut Crashed Into Earth 'Crying In Rage' : Krulwich Wonders... Everyone knew the mission would fail — the technicians, the pilot and the friend who would replace him if he deserted the mission. But Soviet leaders demanded a triumph in space, and so in 1967, Vladimir Komarov allowed himself to be launched towards his own death. Editor's Note, Updated April 24, 2012: We received many comments and questions on this post, which you can read here. Robert later wrote this update to this story with more details and amendments. So there's a cosmonaut up in space, circling the globe, convinced he will never make it back to Earth; he's on the phone with Alexei Kosygin — then a high official of the Soviet Union — who is crying because he, too, thinks the cosmonaut will die. The space vehicle is shoddily constructed, running dangerously low on fuel; its parachutes — though no one knows this — won't work and the cosmonaut, Vladimir Komarov, is about to, literally, crash full speed into Earth, his body turning molten on impact. As he heads to his doom, U.S. listening posts in Turkey hear him crying in rage, "cursing the people who had put him inside a botched spaceship." This extraordinarily intimate account of the 1967 death of a Russian cosmonaut appears in a new book, Starman, by Jamie Doran and Piers Bizony, to be published next month. The authors base their narrative principally on revelations from a KGB officer, Venyamin Ivanovich Russayev, and previous reporting by Yaroslav Golovanov in Pravda. This version — if it's true — is beyond shocking. In 1967, both men were assigned to the same Earth-orbiting mission, and both knew the space capsule was not safe to fly. Komarov told friends he knew he would probably die. But he wouldn't back out because he didn't want Gagarin to die. Gagarin would have been his replacement. The plan was to launch a capsule, the Soyuz 1, with Komarov inside. The next day, a second vehicle would take off, with two additional cosmonauts; the two vehicles would meet, dock, Komarov would crawl from one vehicle to the other, exchanging places with a colleague, and come home in the second ship. It would be, Brezhnev hoped, a Soviet triumph on the 50th anniversary of the Communist revolution. Brezhnev made it very clear he wanted this to happen. The problem was Gagarin. Already a Soviet hero, the first man ever in space, he and some senior technicians had inspected the Soyuz 1 and had found 203 structural problems — serious problems that would make this machine dangerous to navigate in space. The mission, Gagarin suggested, should be postponed. He'll die instead of me. We've got to take care of him. The question was: Who would tell Brezhnev? Gagarin wrote a 10-page memo and gave it to his best friend in the KGB, Venyamin Russayev, but nobody dared send it up the chain of command. Everyone who saw that memo, including Russayev, was demoted, fired or sent to diplomatic Siberia. With less than a month to go before the launch, Komarov realized postponement was not an option. He met with Russayev, the now-demoted KGB agent, and said, "I'm not going to make it back from this flight." Russayev asked, Why not refuse? According to the authors, Komarov answered: "If I don't make this flight, they'll send the backup pilot instead." That was Yuri Gagarin. Vladimir Komarov couldn't do that to his friend. "That's Yura," the book quotes him saying, "and he'll die instead of me. We've got to take care of him." Komarov then burst into tears. On launch day, April 23, 1967, a Russian journalist, Yaroslav Golovanov, reported that Gagarin showed up at the launch site and demanded to be put into a spacesuit, though no one was expecting him to fly. Golovanov called this behavior "a sudden caprice," though afterward some observers thought Gagarin was trying to muscle onto the flight to save his friend. The Soyuz left Earth with Komarov on board. Once the Soyuz began to orbit the Earth, the failures began. Antennas didn't open properly. Power was compromised. Navigation proved difficult. The next day's launch had to be canceled. And worse, Komarov's chances for a safe return to Earth were dwindling fast. All the while, U.S. intelligence was listening in. The National Security Agency had a facility at an Air Force base near Istanbul. Previous reports said that U.S. listeners knew something was wrong but couldn't make out the words. In this account, an NSA analyst, identified in the book as Perry Fellwock, described overhearing Komarov tell ground control officials he knew he was about to die. Fellwock described how Soviet premier Alexei Kosygin called on a video phone to tell him he was a hero. Komarov's wife was also on the call to talk about what to say to their children. Kosygin was crying. When the capsule began its descent and the parachutes failed to open, the book describes how American intelligence "picked up [Komarov's] cries of rage as he plunged to his death." Some translators hear him say, "Heat is rising in the capsule." He also uses the word "killed" — presumably to describe what the engineers had done to him. Both sides in the 1960s race to space knew these missions were dangerous. We sometimes forget how dangerous. In January of that same year, 1967, Americans Gus Grissom, Ed White and Roger Chaffee died in a fire inside an Apollo capsule. 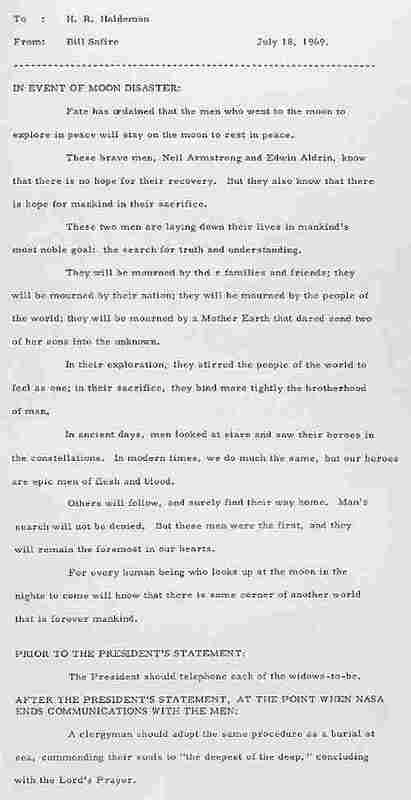 Two years later, when Americans landed on the moon, the Nixon White House had a just-in-case statement, prepared by speechwriter William Safire, announcing the death of Neil Armstrong and Buzz Aldrin, had they been marooned or killed. Death was not unexpected. 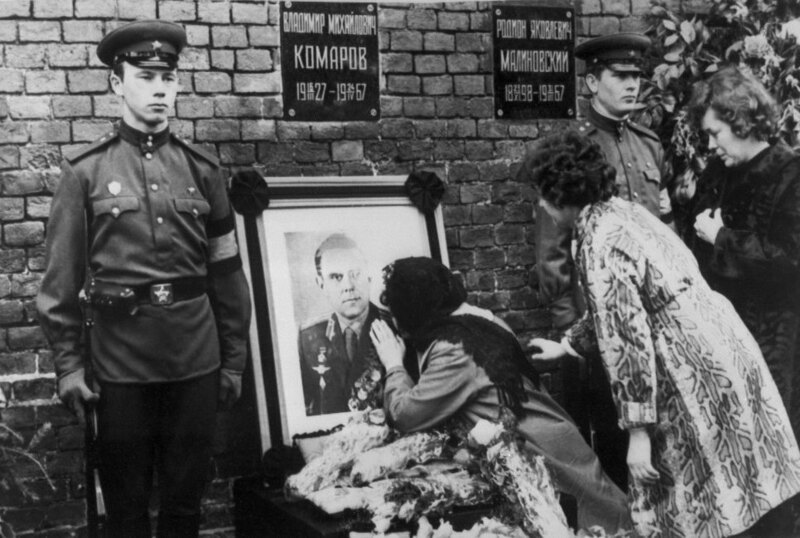 Valentina Komarov, the widow of Soviet cosmonaut Vladimir Komarov, kisses a photograph of her dead husband during his official funeral, held in Moscow's Red Square on April 26, 1967. But Vladimir Komarov's death seems to have been almost scripted. Yuri Gagarin said as much in an interview he gave to Pravda weeks after the crash. He sharply criticized the officials who had let his friend fly. Gagarin met Russayev at his family apartment but refused to speak in any of the rooms because he was worried about bugs. The lifts and lobby areas were not safe, either, so the two men trudged up and down the apartment block's echoing stairwells. The Gagarin of 1967 was very different from the carefree young man of 1961. Komarov's death had placed an enormous burden of guilt on his shoulders. At one point Gagarin said, "I must go to see the main man [Brezhnev] personally." He was profoundly depressed that he hadn't been able to persuade Brezhnev to cancel Komarov's launch. Shortly before Gagarin left, the intensity of his anger became obvious. "I'll get through to him [Brezhnev] somehow, and if I ever find out he knew about the situation and still let everything happen, then I know exactly what I'm going to do." Russayev goes on, "I don't know exactly what Yuri had in mind. Maybe a good punch in the face." Russayev warned Gagarin to be cautious as far as Brezhnev was concerned. "I told him, 'Talk to me first before you do anything. I warn you, be very careful.' "
The authors then mention a rumor, never proven (and to my mind, most unlikely), that one day Gagarin did have a moment with Brezhnev and he threw a drink in Brezhnev's face. Yuri Gagarin died in a plane accident in 1968, a year before the Americans reached the moon. 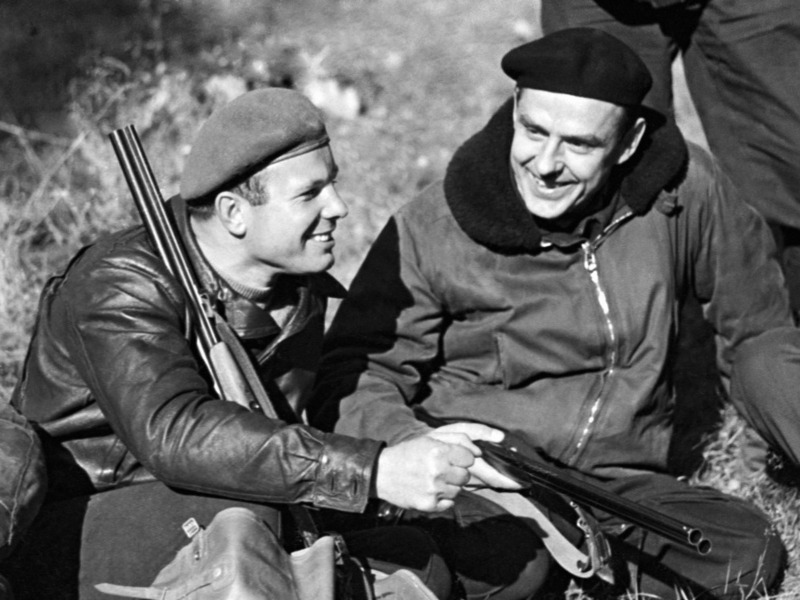 Jamie Doran and Piers Bizony's book is Starman: The Truth Behind the Legend of Yuri Gagarin (Walker Publishing 2011); Yaroslav Golovanov's interview with Yuri Gagarin was published in Komsomolskaya, Pravda, June 11, 1989. Venyamin Russayev's stories about Gagarin and Komarov appeared in 2006 in Literaturnaya Gazeta and were republished on several websites.